The Göbeklitepe archaeological site in Şanlıurfa, one of Turkey's most historic provinces, is preparing to host more tourists than ever before after Culture and Tourism Minister Mehmet Nuri Ersoy said that they will recognize 2019 as "Göbeklitepe Year." Registered previously on UNESCO's Tentative List of World Heritage Sites, the archaeological marvel entered the main list in July and has since seen an influx of local and international tourists. 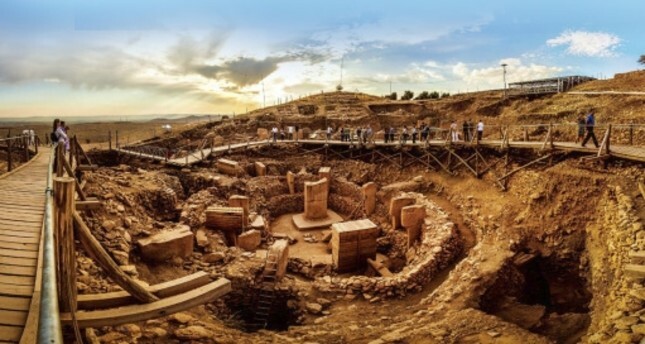 Promotional activities at international fairs, conducted mainly by the Culture and Tourism Ministry, the Şanlıurfa governorate, Şanlıurfa Metropolitan Municipality and by representatives from the tourism sector, have boosted the interest in Göbeklitepe. Even the summer months, which are described as "dead season" for tourism due to hot weather conditions, saw huge crowds come to the city, where hotel occupancy rates are still 90 percent, despite the winter season. The city hosted more than 1 million tourists who stayed for more than one day last year while the site took some 5 million daily visitors. Şanlıurfa Gov. Abdullah Erin told Anadolu Agency (AA) that the city wants to get what it deserves in terms of tourism with Göbeklitepe. He added that Şanlıurfa has a rooted history and bears traces of various ancient civilizations. The governor pointed out that the exploration of Göbeklitepe will change world history. "Although the archaeological site was partially closed last year due to some infrastructure work, it hosted some 1 million visitors. We surpassed our tourism target for this year as well. Also in the following year, we will go on promoting our city around the world using informatics and technology," he said. Stressing that they are expecting a record increase in the number of visitors for the next year, Erin said, "We will face a great increase in the number of visitors in the following periods. Last year, we hosted more than 5 million daily visitors in addition to some 1 million tourists who stayed overnight. There is stream of tourists who pay a daily visit to Göbeklitepe, spend some part of the day there and then go to the other cities. Thanks to Göbeklitepe, the number of tourists visiting Şanlıurfa will also change. We expect a serious increase in the number of foreign tourists. We have taken preparations with the local authorities, as directed by the Culture and Tourism Ministry. We are trying to offer an infrastructure that is suitable for the expected increase in the number of tourists. We have conducted studies to encourage investors and increase the numbers of accommodations." with tourism representatives from all around Turkey with the patronage of the Ministry of Culture and Tourism to build more hotels. "We are negotiating with state officials for getting special supports that will encourage new hotels investments. We will also carry out a project that will transform some historical houses at suitable locations in the city into guesthouses. The city governorate will also work to restoring the existing hotels and guest houses," he said. Şanlıurfa Metropolitan Municipality Mayor Nihat Çiftçi said: "After Göbeklitepe was registered on the UNESCO World Heritage List, it has witnessed a boom in tourism. The archaeological site hosted tourists from all around the world. Many famous people have visited Göbeklitepe." He said that Göbeklitepe comes first among the city's most important places. it is time to open to the world tourism. We will globalize thanks to our values such as Göbeklitepe and archaeological assets," he said. Çiftçi added that they transformed historic buildings into boutique hotels to solve the accommodation problem. "We plan to transform 11 old houses into boutique hotels. We completed restoring some of them and put them into service this year. We want to host our visitors to venues that smell of history and are compatible with the historic layers of the city. The municipality wants to put all the suitable buildings into tourism service," he concluded.